Acne is often considered to be a hormonal disease as it is closely linked to disturbances in the level of hormones. In fact, hormonal acne is considered to be a symptom of disturbance in the internal mechanism of your body. Hence, in order to cure acne, you have to pay attention to your body with the help of certain guidelines. The word hormones is derived from the Greek word Horman which means 'to set in motion'. The role of hormones is extremely important as they act as chemical messengers that pass instructions within the cell. Hence, if the hormones are disturbed, there is a miscommunication between various cells in the body. You will also be interested to know that hormones are responsible for controlling the amount of sebum or oil that is produced by the sebum glands. Hence, if there is hormonal imbalance in your body, your sebum glands may start producing excess of oil which can then combine with toxins and skin debris to give rise to acne. Therefore in order to prevent acne, you will have to first manage restore the imbalance. However, Hormonal balance is a very delicate state that can be disturbed anytime due to many reasons including stress and other physical factors. Hormonal acne can also be caused if the Liver does not expel the used hormones from the system. Hence, excess hormones may get stored in your system, triggering the over production of sebum. When this happens, acne is inevitable. But why does the Liver fail to expel these used hormones? This may happen if your liver is sluggish and is congested with toxins. Hence, the role of liver is also important in prevention and cure of acne. Prostaglandins are essential biochemicals that are responsible for regulating the androgen hormones. These androgen hormones control the skin oil glands that produce sebum. Hence, if these hormones are not in balance, excess of sebum is produced giving rise to hormonal acne. Therefore, if you want to cure acne you have to ensure that your body produces sufficient Prostaglandins. To produce Prostaglandins, You have to provide your body with fatty acids and essential nutrients in the right proportion and ratio. 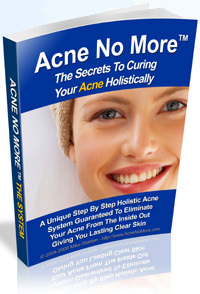 Hormonal acne is difficult to cure. However the task is not impossible. As hormonal imbalance is caused due to complicated factors like hormonal imbalance and build up of toxins, Conventional treatment is not at all effective when it comes to dealing with all these aspects. In fact, the use of conventional drugs can aggravate your hormonal imbalance and excess dosage can even damage your liver. Therefore, rather than curing hormonal acne, conventional treatment will aggravate this condition in the long run. Therefore, to cure this embarrassing skin problem, you have to choose a treatment approach that performs the following functions. 1. Restoration of Hormonal balance. 3. Strengthening the Liver to aid the expulsion of used hormones and toxins. Now this challenging task is undertaken successfully only by Holistic approach. Holistic approach is a comprehensive, safe and multidimensional treatment approach that promotes complete healing by addressing the root causes of the condition. Besides restoring hormonal balance, holistic approach can help you produce the right amount of Prostaglandins with the help of a carefully formulated diet and other techniques. Holistic approach will also strengthen your liver thereby aiding the process of detoxification. The practitioner will also guide you with the help of certain exercises, lifestyle modification programs and more. Besides concentrating on your physical health, Holistic approach will also improve your emotional state and well-being. Hence, you can learn how to manage your stress and other emotional issues. Management of stress is especially important as hormonal imbalance can be caused due to this factor. This unique treatment approach is therefore successful in eliminating hormonal acne completely and can even make an individual healthier and happier in the process.